Remember how we all loved the game "Telephone" in kindergarten? Well, add in a cake, and the fun never stops! Although I suppose if Aunt flashed Mom that would liven up the party, and it's certainly preferable to Aunt slashing Mom. Here we have a beautifully done blue horse. Unfortunately, it was supposed to be a blue house. If your message is "Philip...Woohoo! ", and you actually have to say the words "dot dot dot", be prepared for just about anything. Although interestingly enough, I think that icing IS light pink. I guess the decorator was covering all her bases. Which brings me to our new category: "Literal LOLs". These are some of my favorite kinds of Wrecks, so keep an eye out, Wreckporters! Thanks to Danielle M., Stefanie D., Rachel S., Michael T., and Chandra. these had me laughing so loud my boss had to check if I was okay. These are hysterical! My favorite is the "That That That" cake. So fun to start my day with a giggle. Thanks! Okay, I'm stumped by "black high heel". I get black, and high, but heel? How do you get "mountain" out of "heel"? I love trying to figure out what the miscommunication one... Aunt/Mom took me forever to figure out! The Philip THAT THAT THAT is hysterical!! On that last one, it looks like "Welcome Baby" was written by one person, and "in Pink" was written by another - or at least by the same person at different times. The styles are just slightly different. Which leads me to believe that they did it correctly, and then thought, "Oh, were we supposed to add 'in Pink,' or was that just an instruction? Better safe than sorry!" Hilarious dot dot dot SO funny! Your blog is hysterical - you people need your own youtube channel (cake wrecks with commentary) - you're like the carrot top of cake wrecks. BAHAHAHAH black high HEEL. You know that was here in the South..heel and hill don't sound alike anywhere else! I don't get the first one. I know it's wrong, but I don't get it. Must be the blonde hairs on my head again. Aunt flash mom... oh my! Let's hope Joe isn't in the closet or that cake is really going to liven up the party a bit. Bwahahaha! I have to wonder what the cake decorators are thinking. Is there someone in the Food Lion bakery going, "They want what? Okay. Aunt Flash Mom it is. Weirdos." Or is there just mental white noise? I love the new category! I just found your blog a few days ago and my friends and I are all hooked. So so funny. "um...Yes, I would like a cake with "phillip dot dot dot woohoo", "okay, that will be ready to pick up in 2 days"
cake "decorator"(I think I used those right:) to coworker-- "gee, thats funny they want the words "that that that" between phillip and woohoo...guess its an inside joke..oh well"
That "Aunt Flash" cake is perplexing...but the yellow on the last one just hurts your eyes this early in the morning! I'm loving your site! I was puzzled by the one with the blue horse. The candles look rather like syringes, I think. Stop by my poetry blog, Poetikat's Invisible Keepsakes and see if there's anything that interests you. These caks are funny but it's the quick witted commentary that makes Cake Wrecks so much fun. I bet that last one really had people laughing. Best time to screw it up - AFTER The hugely stressful painful even of childbearing. I bet that Mom didn't give a damn and just laughed. BESIDES the "in Pink" brilliance, The cake is actually kind of fun! No idea if it was on purpose but it has a yummy abstract feel. Plurals never have apostrophes, even if you're making the plural of LOL. 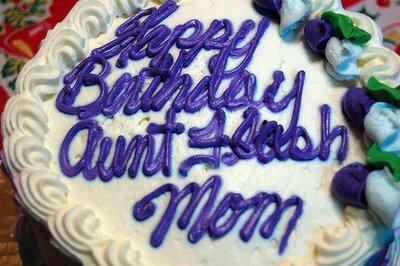 Ohhhhh Cake Wrecks....You never disappoint! The "in Pink" is in a different handwriting (or at least done at a different time) than the "Welcome Baby" perhaps they were second guessing themselves for the moment? Those are all so wrecktacular!! The Aunt Flash Mom decorator has apparently been to some of our family gatherings. The Literal LOLs are definitely my favorites. I got flowers from a friend once that said, "Hope you feel better. Under that. Love (insert name)". Guess it must be hard to take directions over the phone. Do these people have to go through any type of schooling?? I had to read the comments in order to figure out the heel/hill mistake. I was staring at the picture for an embarrassingly long time trying to connect "heel" to "mountain"! I guess it shouldn't surprise me that there are SO MANY decorators out there that don't think twice about what they're writing. Makes for great laughs! The black high heel is hysterical!! 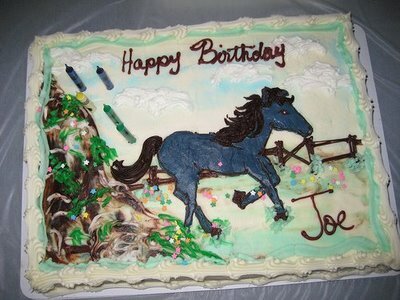 Where am I able to get a horse cake? I mean house? OMG! ROTFLMAO! Heck, I thought it said, "Aunt FLESH".. but that's just me, I guess. BEYOND HILARIOUS! This blog makes my day! Black HEEEIILLL.. Too much! And.... that..that..that.. OMG, I must stop laughing!! This site is addictive! i love the literal mistakes the best! I think this is one of my all-time favorite posts. Ok, if nothing else, I have to say that reading your blog has DEFINITELY taught me how important clear and defined communication with any cake decorator is in the future. "Black high hill" XD And of course the airbrush went wild over the edge of the "hill"
excuse,is't made by your hand? Aunt-Mom ??? I says, "Pardon?" I guess I am not familiar with the 'flash' punctuation but I am familiar with things like commas, periods, colons, and such. These are so so so funny. You know God had a sense of humor when he created some of these people. lol. I love the "black high hill" one the most. I can hear that Southern accent all the way up here in Massachusetts! haha wow! those are really entertaining! I bused out laughing on these - these are fantatically funny! I agree with Angela's comment. You know the person who called in on Cake #1 must have had a southern accent. Because "Black High Heel" in a southern accent sounds just like "Black High Hill." Well, I have to admit -- there's a part of me that loves the blue horse. Oh wow!! Do I laugh or cry!! These are GREAT! 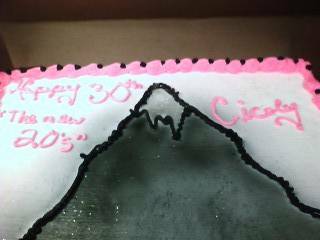 Inquiring minds want to know - Were Phillip's pink and yellow girlie roses the choice of the "decorator" or whomever ordered the cake? These are awesome! Black High Hill..... Aunt Flash Mom... I check in daily for my daily dose of laughter!